X Games 13 Rally Super Special: Full Recap | What in the World Rally? It was supposed to be a few runs through a stadium super special. Then came the insanity. The first run for Ken Block and Andrew Comrie-Picard was incredible. It ended with Ken Block clipping a barrier, dragging a planter (complete with shrubbery) underneath the car, reversing to get rid of it, bumping into another concrete barrier, losing the front right tyre completely and damaging his suspension and turbo! But he still won over ACP, whose ailing engine caused him to land too short on the crossover jump, slamming the back wheels against the ramp and breaking his rear suspension. Absolute mayhem! Kudos to Block’s mechanics, who repaired his car in time for the next battle. 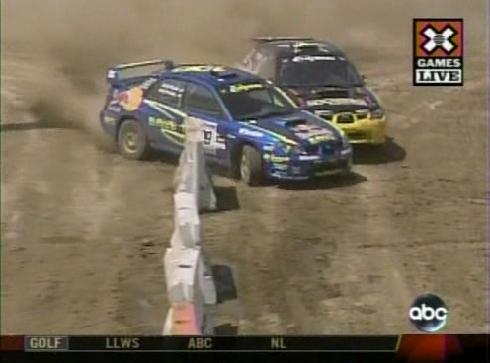 Colin McRae, celebrating his 39th birthday, took it easy on his match against Ramana Lagemann. Lagemann’s engine wouldn’t reach above 4000 rpm, so with no chance to win, he stopped the car. 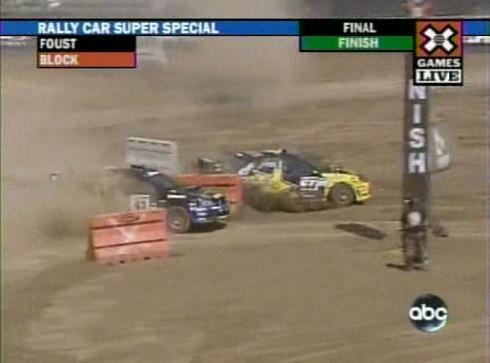 Next, both the Rock Star Subaru teammates went head to head in a round that looked like someone held up a mirror against the entire track. But it was Tanner Foust’s smooth drifter-style moves that put him ahead of Rally America points leader Andrew Pinker. That is, until Pinker hit a barrier in the asphalt section, came into the stadium jump too sideways and hit the front left into the wall. That second impact threw his trunk door open, which made quite the spectacle as he went on to hit the last few hydrobarriers at the finish. But he did finish! The real shocker came when, after a pretty tidy run that put him well in the lead, Colin McRae–rally legend and my favorite to win–ran wide into the hydrobarriers, which tucked under the car to form a ramp. And again, over he went, rolling the car. 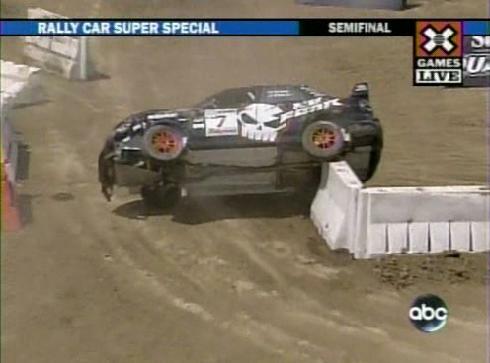 Except this time, he landed with a corner of the now twice-battered Subaru atop the barrier, with no way of coming down. Colin was so good during practice. With 146 WRC starts, this man has more experience than all of the other drivers put together. But he made the rather silly mistake of accelerating just a bit more, in order to gain speed where he didn’t need any. Sigh. That just means he has to come back to Los Angeles next year to claim the gold medal! Californian rally fans 1, Colin McRae 0. The penultimate match up, and the mayhem still continued unabated. 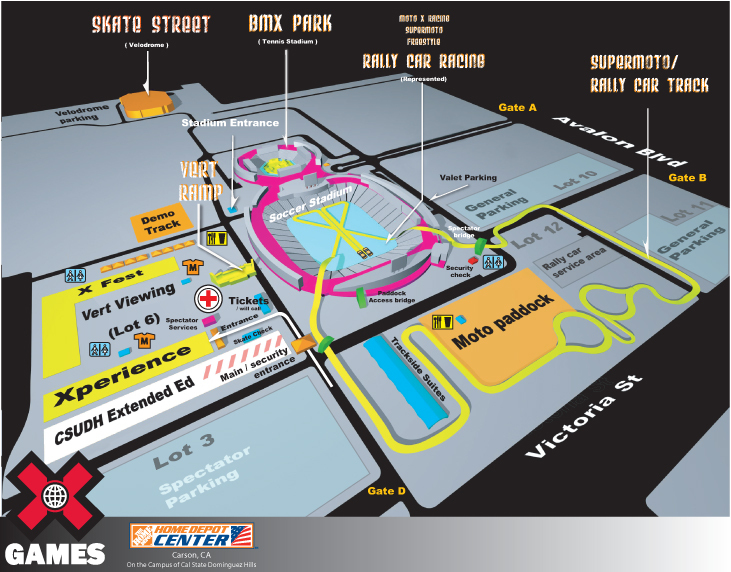 The gap that Travis Pastrana opened up against Tanner Foust was small, but would have guaranteed him victory. But that slow 2 right caught Travis out. 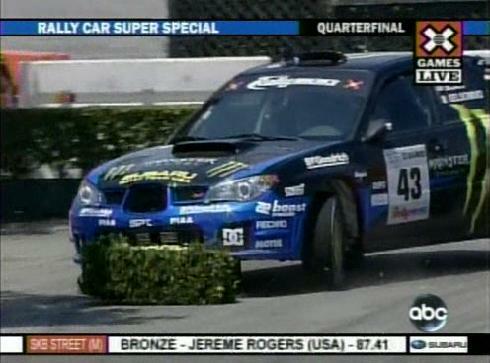 He came in too fast, crashed through the barriers into the other course, hitting Foust’s car! He was faster, but had to be disqualified for crossing the finish line in the other lane. Rallying may be nuts, but rules are rules. Travis didn’t mind–he had an absolute blast! So the final consisted of Tanner Foust and Ken Block, who might still have been in a state of disbelief at advancing the round against Colin. Tanner Foust, though, was a bit worried about the handbrake that had snapped off in his hand. But whatever advantage Ken Block gained midstage, Foust had somehow recouped the time by the finish. The two cars were neck in neck, but both of them came into the finish, again, too fast. As luck would have it, Block’s car served as a snow bank for Tanner to bounce off of. And there you have it. Tanner Foust, stunt driver and drifter extraordinaire, is also now the gold medalist at the X Games Rally Car event. Whew! By the end, my jaw was tired from dropping so often and my head was buzzing from the excitement. I don’t even think we see this much carnage on the Acropolis! But, all this chaos just goes to show the American public what rallying is all about. Yes, they keep going even on three wheels. Yes, they drive even when their brakes are out. Yes, they roll the car and keep on driving. And yes, when you think you’re in trouble, you hit the accelerator. Anything can happen in rallying, and whatever happens, it’s always spectacular! August 7, 2007. Auto Racing, Motorsport, News, Rally, Rally Reports, Rallying, Subaru.